Tails piloting the Cyclone in walker mode. Not to be confused with the other vehicles called "Cyclone". 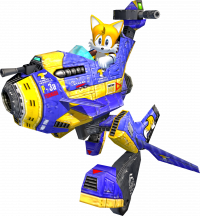 In Sonic Adventure 2, the Cyclone is Tails' multi-transforming mecha. It can take the form of a walker (the standard configuration, used during the majority of Tails' levels), a jet called the Tornado III, and an automobile (used on Route 101). The walker form features a guided laser mode (alike to that of E-102 in Sonic Adventure) and a single shot cannon. This cannon gains an upgrade to allow it to destroy metal crates as well as wooden ones. It is never featured as playable in the Tornado III setting; however, it is driven in automobile mode in one level, where it is shown to possess a boost function once a multiple of 20 rings has been collected. In Sonic Adventure 2: Battle, it is possible to get a secondary "costume" for the walker allowing you to use one that looks like the Tornado I; however, this is only available in multiplayer versus. This page was last edited on 7 August 2010, at 13:39.